Free public parking. Wheelchair accessibility is available from rear of the parking garage. The Max bus stop - 47th and Wyandotte stop. 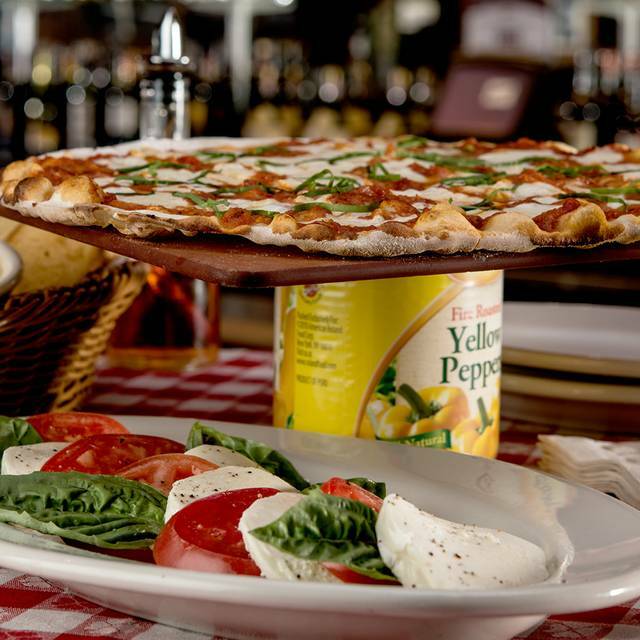 Craving authentic Italian food in Kansas City, MO? Look no further! 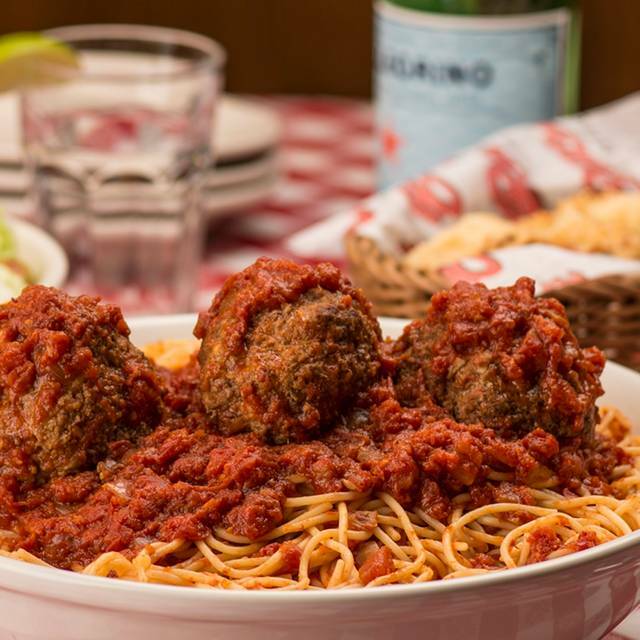 Book your reservation today with Buca di Beppo Kansas City-Plaza, the Italian restaurant known for traditional pastas in homemade sauces, specialty pastas, mouthwatering entrees and fresh-made breads, salads and pizza. 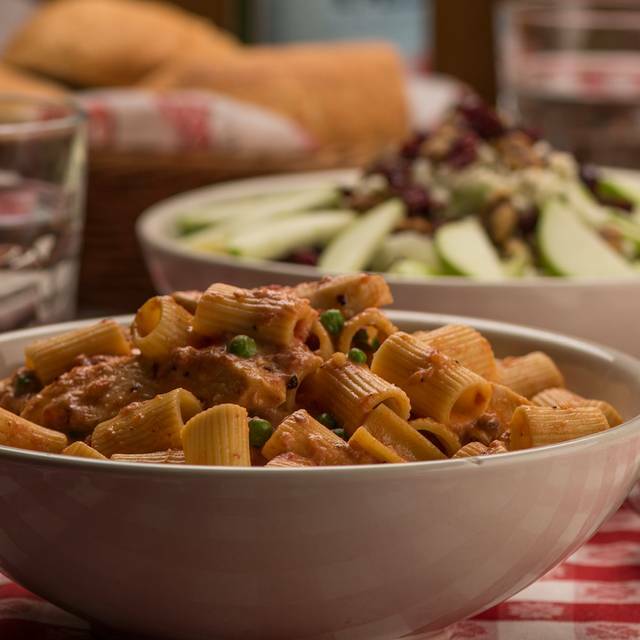 Favorites include Baked Ziti, Chicken Parmigiana, Lasagna, Spicy Chicken Rigatoni and Shrimp Fra Diavolo with dishes served family-style; Small feeds 3 and Large feeds 6. But leave room for dessert! 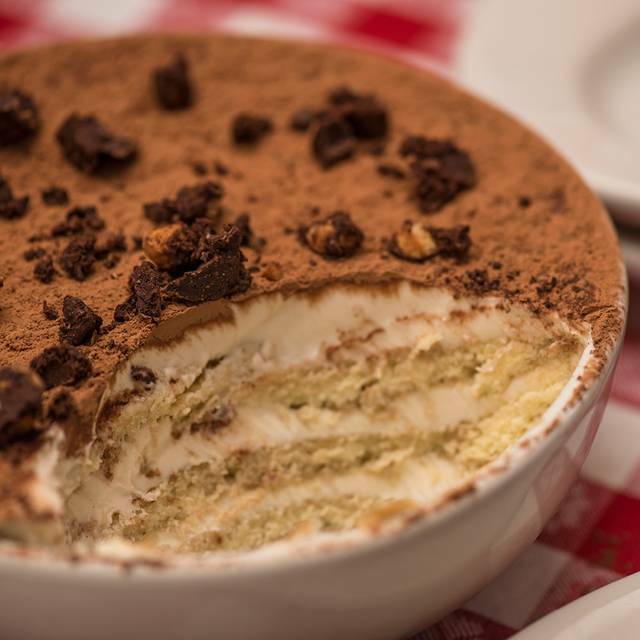 Cannolis stuffed to order, homemade Cheesecake and artisan Gelato aren’t to be missed. Whether you’re spending the day shopping at the Country Club Plaza or discovering the Nelson-Atkins Museum of Art, Buca’s warmly decorated dining and semi-private rooms are perfect for enjoying a relaxing meal, everyday dining or celebrating any occasion for parties and groups both small and large. Can’t join us at our table? 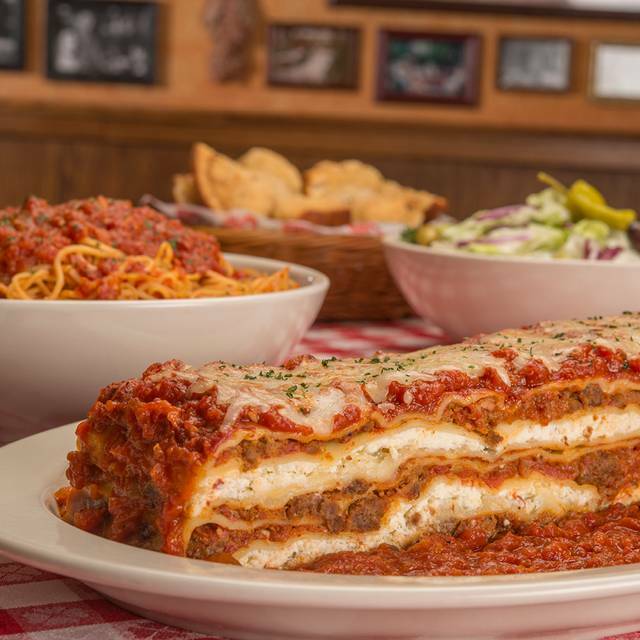 Call ahead or order online for To Go or delivery. Catering also available. It was so loud and so hot we could not talk to anyone other than the person right across or next to us. We arrived for our 730 reservation at 725. We were not seated until almost 8. We ordered 1 app right away and it came quickly as did our drinks. e ordered a salad and it came out in a reasonable amount of time. We had to ask for new plates for our salad....our entrees did not come for over an hour. It was a birthday dinner and we didnt even order the birthday sundae because we just wanted to get out. This is such a great place to go for prom!! It’s very inexpensive, and it’s fun!! Haven’t been in awhile. Forgot how awesome and unique this place is! Went to celebrate my granddaughters 9th birthday. She was impressed. I was happy they brought her dessert and sang to her. The experience was good, only complaint was where they seated us. The food was good and the service was great. Always a fun time when we go. My husband was not a fan of Buca but after this experience he changed his mind.. The service was great and the food was delicious. We even got a birthday sundae that was very good but also very big like everything there. We will definitely be back. It smelled bad, no one was there. The food wasn’t good. I don’t understand how that place is still in business. I made reservations but still had to wait. I think walking in thru the kitchen in unsanitary, they definitely should change that. When we were seated we were seated in the forgotten about area in the very back where it was stuffy and hot. It took forever for our food to come and the spaghetti was watery. When the manager came he said they didn’t drain the pasta water for the right amount of time. I feel if the prices were going to be so expensive for each individual item then there should be no errors made like that. I was very disappointed and will never go back. I submitted a review through Trip Advisor as well....this is a well known family restaurant in KC but I will tell you that the night we were there they stuffed us in a corner booth and the area was so crowded that the waitress couldn't even get to our table, she had to reach to give us items...it really seemed that they determined quantity over quality.....the food was ok, the portions and servings were big because it is family style foods....there are better Italian restaurants in KC if you want to go there otherwise, the restaurant is just okay. Cheer celebration with 60 friends! We had a blast and the food was great. Service was amazing. The only reason I said 4* instead of 5* is because they left off my daughters name on the birthday board out front. We confirmed this when I made the reservation and she was a little disappointed that her name wasn’t on the board. Delicious food and dessert. Staff very accommodating for first timers, and to my girlfriend. Although we had made a reservation nearly a month in advance we waited over 30 minutes to be seated. The restaurant appeared to be understaffed. Food was fine and atmosphere was good. Have enjoyed many meals here. The food is always good and the service is usually excellent. My wife and I find the photos located throughout the restaurant very interesting. 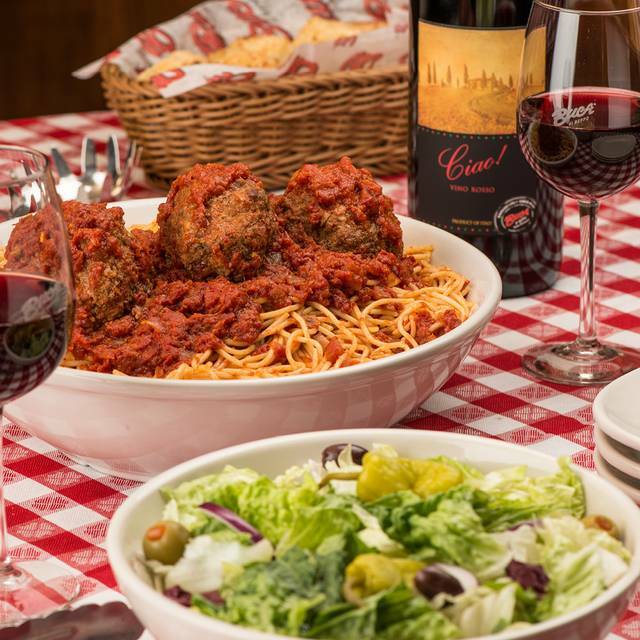 Buca is always fun for a special night out. We celebrated my daughter's 21st birthday there, and they treated her to a dessert and the requisite embarrassing song. : ) Very nice. My husband and son LOVED their ravioli with meat sauce, and our tortellini was good, but a bit dry. It's a lot of food, yes, but I think a tad overpriced for pasta. Still, we'll never stop going! We were greatly warmly and escorted to our seats not long after we sat in the waiting room. Our server was not only helpful, but available for us to call upon them if we needed anything. The food came out about 15 minutes after we sat down, hot and fresh. 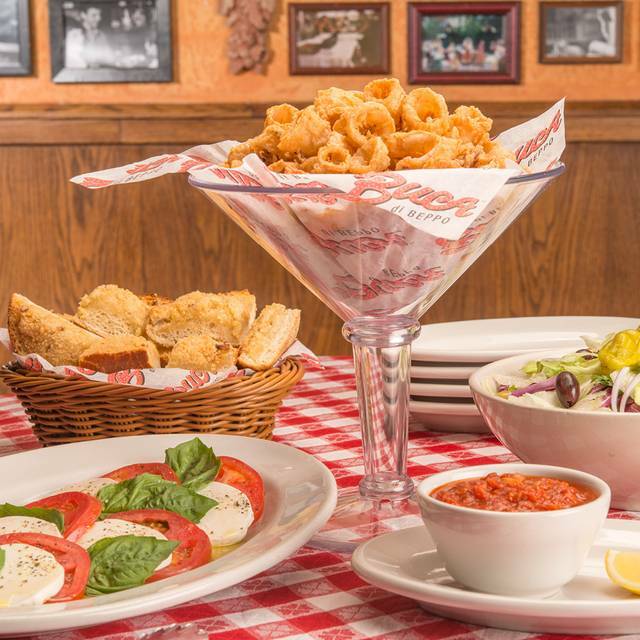 The servings were large, as usual at Buca Di Beppo. Upon leaving we were greeted by almost every employee with a “happy you came” or “come again” which, felt genuine, although I’m sure they are encouraged to do so by their management. Overall, it was a good experience. This is a great atmosphere for groups and a reasonably priced option. Fun place! Food was good and waitress really friendly and attentive! Overall a good experience! 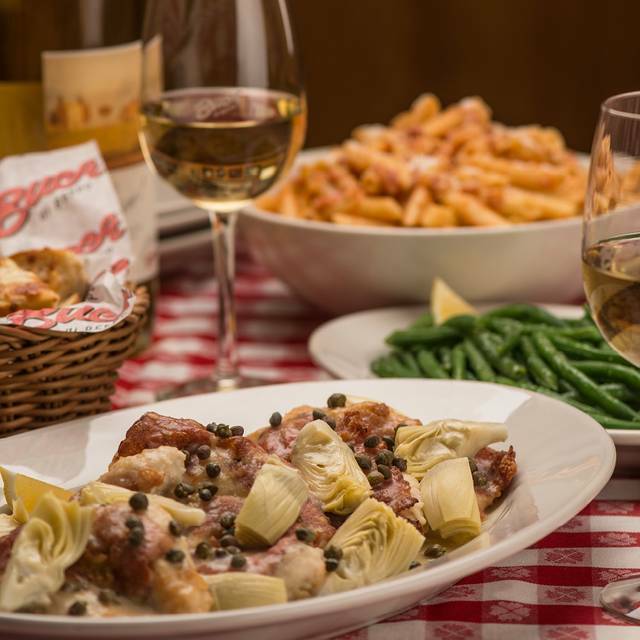 Went to Bucca for a Friday night dinner and was everything about the meal was poor. Sat us for a table for two in the very back corner by the emergency exit. The room was being prepared for a group of 40-50 so our server was more concerned with setting up than attending to his only other table. Both me and my fiancée got glasses of wine with dinner but took 10-15 minutes to receive them. Placed our order for a pizza and the baked ziti. The baked ziti came out first within 15 minutes and was pleased with the temperature and taste of the food but never received the pizza. Had to ask another waiter to get us bread because it was never brought to us since being there...then checked on the pizza and it was never put in....was asked if we wanted to cancel or keep the order. Only positive was when we finally received the pizza it was comped off of our ticket. Overall subpar experience and no real reason to come back. We had a great dinner celebrating my daughters 7th birthday. We ordered our food at 7:20 and did not receive it until 8:45. We were offered a free dessert to compensate. WOW. Who wants dessert after waiting so late to eat. Terrible service. Waiter was friendly but not attentive at all. Never offered to refill waters. Wonderful food, great service & price! We really enjoyed the food, it just felt rather expensive for the amount of food we got. $130 with tip for 4 people to eat a salad, pasta, and one shared dessert with no alcohol for everyone. Our server, Tia, was great and the food was equally great! Our family had a great time, and left satisfied. We have gone to Buca the last 3 years for NYE in KC to start a new family tradition. This year the service was absolutely horrible and we will likely never go back. It's unfortunate b/c in the past we have enjoyed the environment and food, but this year we think the service staff was either drunk, on drugs, or just plain lazy. We waited nearly 30 minutes for a glass of Wine and a Mountain Dew, seeing our waitress (who was very unkept) once every 25 minutes (if we were luck). I love the plaza area but will look to resuming our family traditions at a more appetizing and friendly restaurant. I really hate to see Buca go down the tubes, but it has. I suspect it will be another failed plaza restaurant in the coming years. We took our kids there for New Year’s Eve, and everyone loved it! We ordered way too much food, the small portions of everything would have been enough to share. Had a very bad experience with them. Despite our reservation we had to wait to be seated because they were busy. 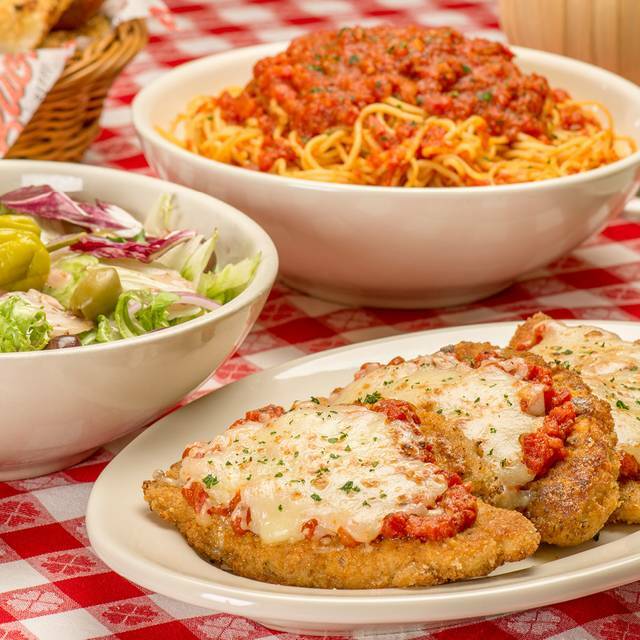 Our entree was switched from Eggplant parmigiana to Veal Parmigiana after waiting very long for it to show up. Then the make up dish (ie paid for the entire meal) wasn’t well done. I am not going back. Very good food with good service, unfortunately it was served on a outdoor picnic table style tablecloth with cheap paper napkins. For the price of the entrees, you might expect a bit better atmosphere without the rock concert loud setting. Family get together, very easy for everyone to talk and enjoy each other’s company without being in the same room as 50 other people.